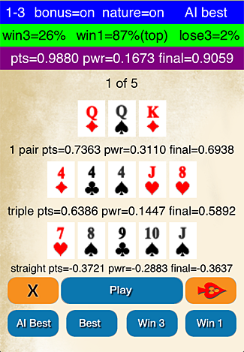 Nlsim Chinese Poker Calculator and Game Version 2 has great improvements especially for handling weak hands. The package now is a ZIP file that has all files. Just download onto your desktop, then unzip on desktop. It should work on all of Windows 7 and 32-bit XP and 32-bit Vista. HAVE FUN. right, to make an example of computer cheating.